In what ways can i use my Fed tax ID- EIN number? Hi Kimberly and thank you for your question. *If you are worried about having to give your social security number to your daycare parents at the end of the year for taxes or for their child care reimbursement you can use this number instead. * I also use mine for filling out all tax forms required by the childcare food program, my registration or licensing, our 1040 tax return at the end of the year-rather, and pretty much any business form so I do not have to use my social. I feel safer using this number because of all of the identity theft that is out there! * As a child care provider with your own small business you will need to pay business taxes. *If you choose to have one or more employees you will need a tax id. 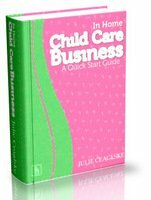 * If you want to open a bank account for your home daycare business. * If you decide that you may want to start a line of business credit. * If you choose to form an LLC, Corporation, or Partnership. My home child care business is LLC (limited liability company). I hope that this will answer your question Kim. As you can see it is an important part of being a professional business owner! Thank you!